The medieval towers of San Gimignano. San Gimignano is the poster child of Tuscan hilltowns, a miniscule medieval metropolis of stone towers bristling above the vineyards that produce a tart, straw-colored white wine ranked among Italy's best. The city was riding high in the 14th and early 15th centuries, when rival textile families counted their worth by the height of their towers (used to dry long cloths and occasionally wage war on each other). When the town's fortunes failed, no one bothered tearing down its antiquated towers, unintentionally preserving San Gimignano for tourism to rediscover centuries later. Try to spend the night: when the tour bus hordes disappear by 5:30pm, the town comes back to life and the medieval air rekindles in its stone-clad alleys. On the main piazza, bustling with tourists, you can tour the Palazzo Comunale, climbing past its lovely small civic museum of paintings by Benozzo Gozzoli, Filippino Lippi, Pinturicchio, and Lippo Memmi—and a room with rare 14th century secular frescoes of a wedding night—to the top of the town's tallest tower, the Torre Grosso (adm), for a postcard panorama of patchwork fields. Locals still refer to the Collegiata as either the Duomo or the Cattedrale even though it's been centuries since San Gimignano has been the seat of a bishopric (you can't call a church a cathedral unless it houses a cathedra, a bishop's throne). Just to confuse things further, the church's official name is Basilica di Santa Maria Assunta. 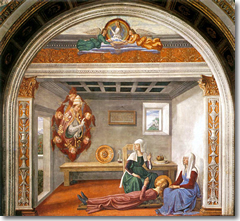 The vision of Santa Fina by Domenico Ghirlandaio in the Collegiata of San GimignanoA side chapel, with an altar by Benedetto di Maiano, was gorgeously frescoed by Domenico Ghirlandaio—the man who taught Michelangelo to point—with the story of Santa Fina, a local girl who lay on a wooden plank for six years, stricken by a paralytic disease, praying and fasting, receiving a vision of St. Gregory the Great (see right) that an end to her suffering would soon come, and dying at the age of 15... and begin performing miracles. Upon her death, the bells throughout town suddenly started ringing of the own accord. Her dead hand rose to clasp the ruined arm of her nurse, healing it. When her body was removed from the plank, white violets—of the type that still bloom in the cracks of San Gimignano's towers—sprang up in its place. Near the north end of town, at Via Folgore 11, is a medieval hospital complex built in 1253 and containing the Spezeria di Santa Fina historic pharmacy, with frescoes by Sebastiano Mainardi and some sculptures by Pietro Torrigiani (most famous for his later sculptural portraits of British monarchs on their Westminster Abbey tombs...and for being the guy who, as a fellow teenaged art student, broke Michelangelo's nose in a fight). The complex now also contains the town's Museum of Archaeology—frequently referred to as the Museo Etrusco for its small but interesting collection of quality Etruscan remains (there are some ancient Roman bits as well)—as well as the new (est. 2006) Modern Art Museum, which features rotating exhibits alongside local 19th-century paintings. Just beyond it, at the far end of town, sits the little-visited 13th century Sant'Agostino preserving gorgeous 15th century frescoes by Benozzo Gozzoli and Sebastiano Mainardi. The Tuscan countryside view from the ramparts of San Gimignano.The best view of the skyline is from the ruined ramparts of La Rocca, a tumbled-down medieval fortress now planted with a tiny town park. If you have more time, you can pay a visit to the modest Museum of Sacred Art (16th century wood sculptures, choir stalls, silverware, and a Crucifix by Giuliano da Maiano) across the pretty little brick patio from the main entrance to the the Collegiata (which, now that they charge admission to the church, is around on the left side). There's also a Torture Museum—largely a collection of medieval torture devices (Iron Maidens, thumbscrews, the rack...that sort of thing), but with informative placards that cheerily explain how many of these instruments are still used by repressive regimes and other unscrupulous types—only these days, they're all also electrified. After you take in the sights in town, why not take a stroll in the countryside that laps against this tiny medieval town's walls? The local tourist office provides maps for a lovely escape from sightseeing, crunching along the gravelly shoulder of a country road, down vineyard-clad slopes and past patchwork fields of green and yellow. Planning your time: The vast majority of people blow in and out of San Gimignano in 2–3 hours—many of them in large groups disgorged from large buses—and you can, indeed, see its greatest sights in just a half a day. However, stay the night and you can see what the town is really like as the sun set and the tour buses depart and the locals creep back out into to take back their ancient streets and alleyways from the tourists. San Gimignano is quite magical in the moonlight, and has some fine restaurants, making it an excellent place to spend the night. 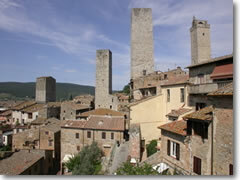 Tourism information in San Gimignano: The San Gimignano tourist office is easy to find: at Piazza del Duomo 1, tel. +39-0577-940-008, www.sangimignano.com. Admissions: The tourist office sells a cumulative ticket that gets you into all the main sights in town (save the privately-run Torture Museum). How to get to San Gimignano: Rent a car. Seriously. Getting to San Gimignano by public transportation is frustrating. First of all, you have to arrive by bus, and very few of those are direct; almost all require a change in the town of Poggibonsi (which is also the site of the nearest train station), from which 19 buses (only two on Sundays) trundle up to San Gimignano in about 10–20 minutes. So first, you have to get to Poggibonsi. Oddly, the bus (www.trainspa.it or www.sitabus.it) is a better option, whether coming from Siena (more convenient than the train) or from Florence (faster than the train). From Siena to Poggibonsi there are buses roughly hourly (35–55 min. ), and up to two trains per hour (27–30 min.). Keep in mind that, in Siena, the bus station is conveniently up in town, at Via Tozzi/La Lizza, whereas the train station is down in the valley, a 5-min. bus ride away. From Florence there are about a dozen daily direct buses (6 on Sundays) to Poggibonsi (50 min.). Trains to Poggibonsi are either direct (60 min.) or require a change in Empoli (90 min.). Book a tour: Prefer to leave the driving and arrangements to someone else? 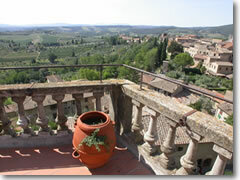 Take a tour of San Gimignano (and Siena) that leaves from Florence with our partners at Viator.com. Near San Gimignano: Chianti (20–30 min. by car), Siena (45–60 min. by bus/train), Florence (75–110 min. by bus/train).